Tudip technologies first edition of “Tudip Tech Star" ends with announcement of 3 winners and 21 recruits. 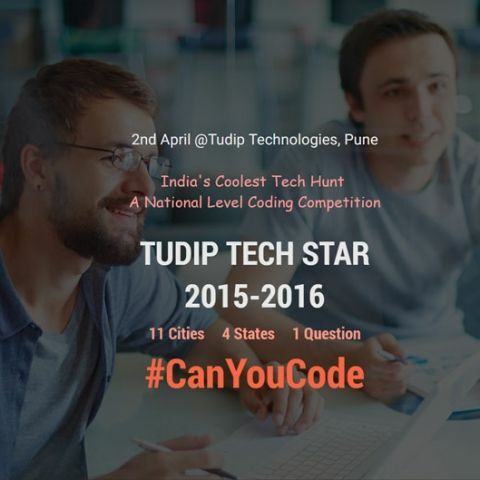 Tudip Technologies coding competition TudipTechStar 2016 winners have been finally announced. Akash Nikam from Pune bagged the first prize, second prize was awarded to Akash Gupta from Aurangabad and the third runner up was Geet Choubey from Nashik. TudipTechStar 2016 ended with a promise to be back next year to motivate students towards learning coding. Empowering Talents – TudipTechStar 2016, a great Success! On Saturday, 2nd April 2016, Tudip Technologies hosted its 1st edition of TudipTechStar prize distribution ceremony at JSPM, Tathawade, Pune. This event bought together 50,000 students, 300 colleges, International speakers and chief guests for an exciting evening which included the winner announcement and cultural programmes. Cache Merrill – CEO, Zibtek. A keen entrepreneur, start-up lover and reckoned TechStar. Dipti Agrawal – Co founder & CEO, Tudip Technologies. A great visionary with a belief that it’s all about providing value to clients and money is just a by-product. She is an excellent technology entrepreneur, highly accomplished leader with extensive experience in business, consulting & project management. Pravin Revankar – Director, Centre for Information Technology, YASHADA. A man of distinct vision and fountain head of illuminating ideas. Tushar Apshankar – Co founder & CTO, Tudip Technologies. Seth Weinert – Director of Sales & Marketing , Zibtek. Tudip Technologies is pleased to announce the winner of TudipTechStar 2016. Presented “Best Coder Certificate” to top 200 students appeared for face to face interview at Tudip’s office. These students got shortlisted from across India on the basis of their coding skills. Through this initiative we have got the fresh bunch of tech talent – who can code and innovate during the journey. In a true sense TudipTechStar. We have decided to conduct this tech hunt every year to motivate students towards learning and discovering themselves. Our students have a lot of talent, this is a platform to build, collaborate and cultivate tech environment which is missing we as a country. This is a step towards it. We truly appreciate untiring efforts of the teachers in harvesting and nurturing great talents. These mentors continue to inspire us to achieve greater heights at Tudip. As Tudip completes its 6 years with a big bang and creating a niche for itself with its key values -Integrity, Innovation & Serenity. We are great believers in Empowering Talent and Connecting Technologies. This year is going to be bigger and better as we head towards creating a mark through Tudip’s Technovision and a Technovator to the country.